There is a new type of gluten free flour out there that I am very interested in. Coffee flour! 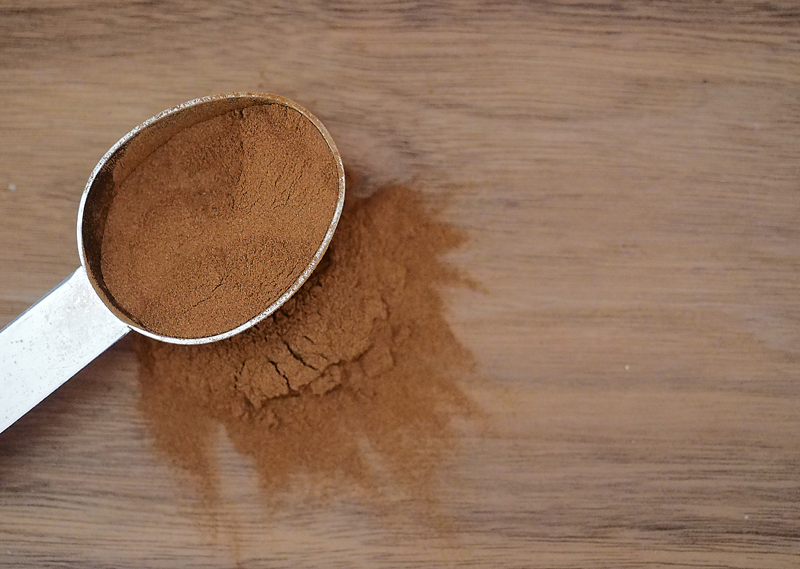 Coffee flour is made from the fruit of the coffee cherry, which means it is caffeinated. This alternative use of the pulp (which would usually be discarded) offers a supplemental income for coffee farmers, and removes bio waste from water sources. The only downside is that this stuff can be hard to find, it can only be ordered online, and quantities are limited. This weekend I was at Trader Joe’s, and on the bottom shelf a bag caught my eye. I had to scoop up a few bags to share with partners, but on the back of the bag is an easy recipe for coffee truffle brownies, so I thought I should share that here as well. I should clarify something, this recipe is easy if you live near a Trader Joe’s. I actually do not, but we do make the trek down south to hit Trader Joe’s. 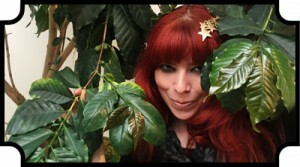 At the end of this post, I’ll include links on where you can buy coffee flour and an alternate recipe for coffee brownies. Most everyone assumes that coffee flour will taste like coffee. It doesn’t. Think of the cascara syrup, remember that dark, fruity smell? That is very similar to what coffee flavor will taste like. I really love to use it with anything chocolate, because it really deepens the flavor. Since the taste is so different and overpowering, you will want to use it sparingly. 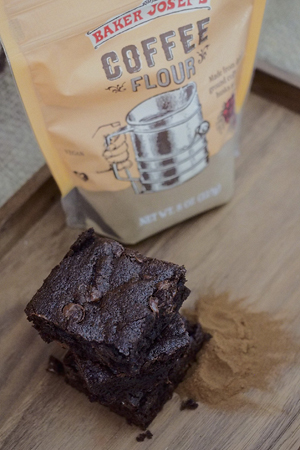 In this recipe for the boxed brownie mix, we are only adding 3 tablespoons of coffee flour. As mentioned above, coffee flour does contain caffeine, approximately 12 grams per ounce. Coffee flour is also very high in fiber, around 7g per tablespoon. Please be aware that to compensate for the increased fiber content, you will have to increase your moisture/water in your recipe. 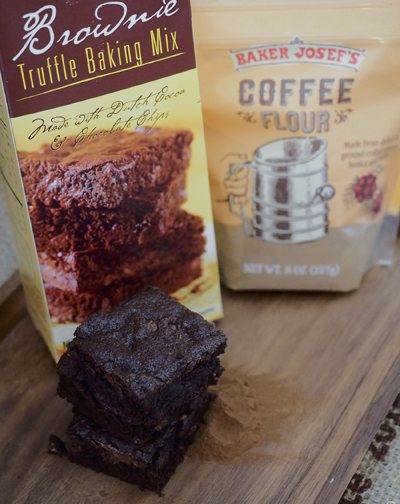 The coffee flour from Trader Joe’s is sourced from Nicaragua. Preheat oven to 350 and butter an 8 inch square baking pan. Whisk eggs and butter until blended. Add brownie mix and coffee flour and stir until moistened. Spread batter in pan, filling corners and leveling top. Allow to cool for 30 minutes before slicing and removing from pan. If you don’t live near a Trader Joe’s, you can purchase coffee flour online from MarxPantry. Looking for more recipes? The official Coffee Flour website has got you covered! Have you tried coffee flour? Please tell me what you think and what you have made with it! Made these today for my birthday for work, with a coffee buttercream. Big hit!! I put coffee flour in my smoothies! It’s awesome in my PBJ smoothie. 1 c frozen raspberries, 1 T trader joe coffee flour, 1/3 plain Greek yogurt (I like Fage), 2 T PBfit peanut powder, 1 handful of baby spinach, 3 packets of stevia, 1/2 c CO2 coconut water, 1/2 c 1% milk, 3-4 ice cubes. Blend in your high speed blender (I have a Ninja). You will have 1 delicious creamy shake with HALF of your day’s potassium and a good amount of fiber taken care of. All of this under 300 calories. You can sub out nutmilks for the milk/coconut water but I need the potassium.